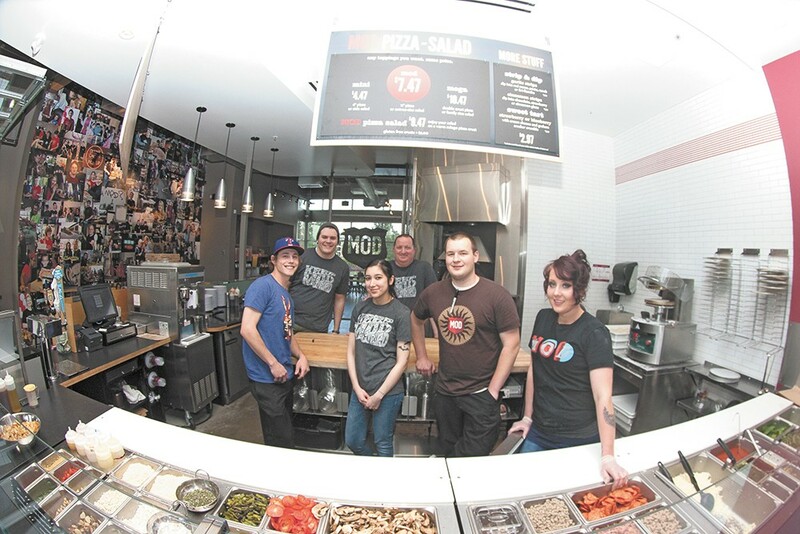 Mod Pizza general manager Michael Sherman (top center) with his employees at the new South Hill shop. Rarely does one feel such power when ordering a pizza. Dozens of toppings — sauces, cheeses, veggies, herbs, meats — are laid out behind the glass, so you can point at will and say, "Cover that baby in mushrooms. And how about a little sun-dried tomato, some grilled chicken and a sprinkling of bacon?" The attendant asks several times, "Is there anything else you want?" The best part about it is you're charged the same no matter how much you pile on. Toppings don't cost extra. "[Customers] love the idea that they're not going to get nickel and dimed for every topping. They have that freedom," says Michael Sherman, general manager of the new MOD Pizza on the South Hill that opened the last week of April. A Seattle couple created MOD in 2008 and the fast-casual chain now has locations nationwide, largely concentrated on the West Coast. The South Hill MOD, which opened next to Target, is the first in Eastern Washington. By the end of the year MOD aims to have 100 restaurants, including opening one on Northwest Boulevard in Coeur d'Alene this summer. In unison, the whole crew shouts an enthusiastic "Hello!" to each customer walking in, and a big, lit-up arrow shows you where to start ordering, like you would at Chipotle. There are three sizes of pizza (which can also be ordered as salads). The 11-inch mod ($7.47) is considered the individual size, although some split it or get a 6-inch mini ($4.47). For families, there's the mega ($10.47), a double 11-inch crust. The 735-degree oven cooks your pie in about three minutes and it comes out with a cracker-like, thin crust. Some might be overwhelmed by their absolute topping autonomy. For them, the menu offers suggestions, like the Tristan, spread with mozzarella, mushrooms, roasted red peppers, Asiago and finished post-oven with pesto drizzle.